It’s taken far longer than he would have liked, but Dallas Cowboys linebacker Jaylon Smith is finally ready to step on an NFL field for the first time. Cowboys owner and GM Jerry Jones announced that Smith will play in Saturday’s preseason game against the Colts. It will be Smith’s first game action since suffering a devastating knee injury while still in college. In the lead up to the 2015 NFL Draft, Smith was considered one of the best players available. In three seasons at Notre Dame, he accumulated 292 tackles and won the 2015 Butkus Award for the top linebacker in the country. However, while playing in Notre Dame’s bowl game, Smith tore both the ACL and LCL in his knee. Despite his stock dropping amidst concern that he wouldn’t make a full recovery, Smith decided to enter the NFL draft rather than return to school. Before the injury, Smith was viewed as an early first round pick. But after the injury, he ended up dropping to the second round, where the Cowboys took him 34th overall. His initial recovery from the injury was slow, and Smith missed his entire rookie season. Even this season, Smith has been a little slow to come back. Since the Cowboys started practicing in pads, Smith has only taken part in nine of 12 practices. He’s also been held out of the team’s first two preseason games. But the time has finally come for Smith to step onto an NFL field. After exhibiting great patience, Smith is excited but remains cautious about his return. Jones says the Cowboys will ease Smith back into game action. Nevertheless, the Dallas owner is excited to see Smith back on the field and commended the work he put in to come back from such a terrible injury. The next step is figuring out where Smith fits into the Dallas defense. 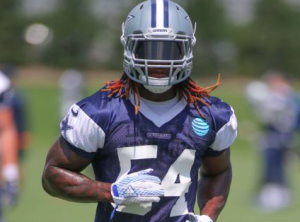 He’s currently listed third on the depth chart at middle linebacker behind Anthony Hitchens and Justin Durant. However, Smith has received first-team reps at practice in place of the banged up Sean Lee, with Hitchens sliding over to weakside linebacker. That could indicate that Smith is working his way into the linebacker rotation. It remains to be seen how much Smith will play in Saturday’s preseason game. But with three exhibition games left before the start of the season, he should have plenty of opportunities to prove that he’s healthy and ready to play in the NFL. Even if he’s not fully recovered from his knee injury and ready to be the star he was projected to be, Smith could still become a welcomed to the Dallas defense this season.